Former Federal Reserve Chairman Paul Volcker is at work on a memoir he says will address the larger themes that have dominated his life of public service, reports The Wall Street Journal. 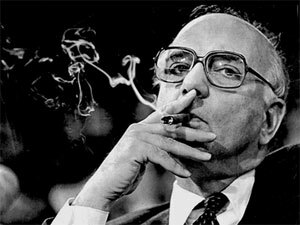 Volcker served as chairman of the Federal Reserve from 1979 to 1987 and is largely credited with battling a price inflation that was at double-digit levels. He fought the inflation by tightening money supply growth and allowing interest rates to soar. Inflation peaked at 11.6 percent in March of 1980 just months after Volcker had announced in October 1979 his plan to battle inflation.The federal funds rate peaked at a record high of 20 percent a few months later in late 1980. During the interest rate climb, farmers protested at the Federal Reserve’s headquarters, and car dealers, who were especially affected by high interest rates, sent coffins containing the car keys of unsold vehicles. Many people also wrote letters to Volcker telling him how they had saved for many years to purchase a home but were now unable to because of high rates. Under severe pressure from the Reagan Administration, he reversed his tight money policy in August of 1982. In other words, Volcker has a lot to tell us about. His book will be published by PublicAffairs, an imprint owned by Lagardere SCA’s Hachette Book Group. No publication date has yet been set. Wuz always a hero of mine. I know. A FED chair?? ?